is displayed at the 2011 Auto Shanghai car show in Shanghai. The Chinese auto industry is overdue for consolidation and General Motors Co. (GM), with local partner SAIC Motor Corp., is interested in acquiring ailing automakers, according to four people familiar with the companies’ thinking. GM, already the top foreign carmaker in China, aims to increase sales by about 75 percent by 2015 to 5 million, and a deal with another automaker is one possible way its ventures can expand, said the people, who didn’t want to be identified because the plans are private. China’s government wants to preserve jobs even as it encourages consolidation that echoes the auto industry’s contraction a century ago that made the Detroit-based carmaker the world’s largest for eight decades. Expanding in China isn’t as simple as going out and buying another plant. Foreign companies face restrictions on the number of partners they can have or how much of a factory they can own. Last year, China said it wouldn’t give incentives for further foreign-owned auto plants. That started raising the value of underused auto plants, of which there are plenty: 10 of China’s 71 automakers didn’t sell a vehicle last year. Two calls to the media office of the National Development and Reform Commission, China’s top economic planning body, weren’t answered. China has the world’s most overcapacity. Factories in China are able to produce about 10 million more vehicles than they currently make, according to LMC Automotive. That’s more than the number of autos made in any country other than China or the U.S.
GM and SAIC have plans to open two assembly plants in China in 2014. Even then, their joint ventures may be capable of making only about 4 million cars, sport-utility vehicles and microvans a year. One way to stay on track with the 5 million target set when growth was more exuberant would be by taking over assembly plants that aren’t operating at full production. GM has built up what it calls a fortress balance sheet with more than $23 billion in cash that gives it flexibility to make acquisitions. “There are no current plans to increase GM’s manufacturing capacity through acquisition or consolidation,” Dayna Hart, a GM spokeswoman in China, said this week in an e-mail. SAIC, based in Shanghai, declined to comment. China passed the U.S. in 2009 to become the world’s largest vehicle market and still has room to grow: While 627 in 1,000 in the U.S. own a car and 517 in Germany, according to the World Bank, in China, it’s only 44. The recovery of residential property prices in China’s major cities has accelerated since early 2012, potentially increasing demand for new passenger vehicles, said Kevin Tynan, Bloomberg Industries automotive analyst. GM sales in China last month soared 26 percent from a year earlier to 310,765, its best month ever. Buick and Chevrolet sales each gained 22 percent. GM has been the largest foreign automaker in China for the past nine years, with about 14.7 percent of the market in 2012. GM said it earned $1.5 billion in 2011 from its joint ventures in China, or almost a sixth of the company’s $9.19 billion (GM) profit that year. Analysts project the automaker, which emerged from a government-financed bankruptcy in 2009, will report its 12th straight quarterly profit (GM) on Feb. 14. While GM has many opportunities among Chinese automakers, which of them is the most probable target is a complex equation that depends on proximity to markets, ease of transportation and incentives offered by local governments in return for the investments, said Han, the Shanghai-based analyst. Some local governments may resist investment and management from overseas or even from another city in China. China signaled in late 2011 that it would be less inclined to sign off on new plants when it said foreign automakers would only be eligible for incentives on new factories approved before Jan. 30, 2012. GM needs to remain aggressive in China. It faces increased competition from Volkswagen AG as the German company aims to become the top-selling automaker in the world by 2018. Among non-U.S. foreign automakers, Wolfsburg, Germany-based VW has fared best in China, almost dethroning GM as the best-selling foreign car company in the country last year. VW, which, unlike GM, includes Hong Kong in its China tallies, said deliveries climbed 24.5 percent to 2.81 million while sales of GM and its Chinese joint venture gained 11 percent to a record 2.84 million. VW’s sales were helped by the introduction of new versions of its Lavida and Audi A4L in the third quarter and from a territorial dispute that fueled anti-Japan sentiment. In September, Toyota Motor Corp. and Nissan Motor Co. reported the steepest drop in sales in China since at least 2008. Other foreign automakers have ambitions for China as well. Nissan, for example, moved the headquarters of its Infiniti brand to Hong Kong to try to gain share in Asia. Ford, which has been a laggard in China, says that breaking into that market is a priority. The Dearborn, Michigan automaker, which sold 626,616 vehicles in China last year, a 21 percent gain, is seeing some early success: Its Focus compact rose to the best-selling sedan in China last year from 10th in 2011. Hyundai Motor Co. and affiliate Kia Motors Corp., both based in Seoul, also see potential in China, with their combined sales rising 14 percent in 2012. All of this growth comes as auto sales continue to gain, if not at the same pace as in the past. Auto deliveries may increase 7 percent to 20.65 million this year, the China Association of Automobile Manufacturers said in January. A consensus is forming that sales may rise to as many as 30 million vehicles by 2020, said Bob Socia, GM China president. He declined to say how GM is looking to expand beyond two new plants planned to be completed 2014. The idea of GM growing through acquisition harkens back to GM’s origins, when founder Billy Durant used his company’s coffers to gobble up rivals as the nascent U.S. industry was consolidating. Few Americans today remember Winton Motor Carriage Co., the Oakland Motor Car Co. or other automakers, also called original equipment manufacturers (OEMS or OEs), of the early 1900s. China is ripe for a similar reckoning, Wilbur Ross, the billionaire owner of parts supplier International Automotive Components Group, said in Detroit last month during a presentation at the Automotive News World Congress. China, with more than 110 auto brands, has about 36 percent of its car-making capacity unused, the equivalent of 10 million vehicles worth of over-capacity, according to LMC Automotive. Of the 71 automakers tracked by the China Association of Automobile Manufacturers, 36 companies sold fewer than 10,000 vehicles in 2012. 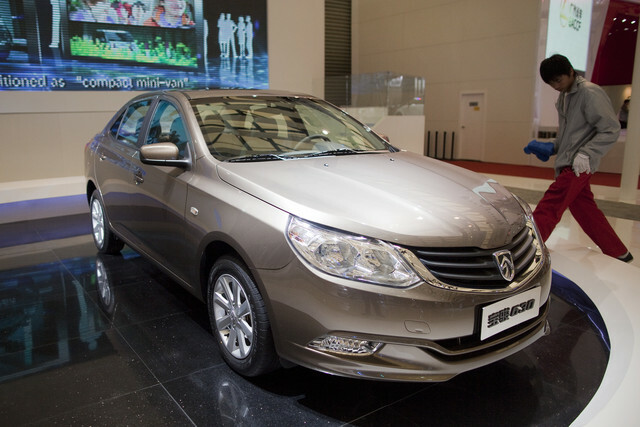 Jilin Tongtian Automobile Co., Jiangxi Huaxiang Fuqi Motor Co. and Liaoning Huanghai Commercial Vehicle Manufacturing Co. are among the 10 that didn’t sell any vehicles last year, according to association data. Han, the CSC analyst, said those aren’t ideal acquisition targets. Local China automakers don’t spend as much to develop new vehicles as global automakers do, Ross said. As a result, the 41 percent of the market they divvied up last year is shrinking, he said. While there may be agreement from industrialists such as Ross to China’s Communist Party that automakers need to consolidate, how such a thing would happen is wide open to speculation, debate and innovation. One notion is that foreign automakers would need to grow through their local partners, which might be better able to negotiate a fair market value for state-owned assets, said Bill Russo, president of auto industry consultancy Synergistics Ltd.
Alternatively, foreign automakers may not want some local capacity in its current form, Jeff Schuster, an industry analyst with LMC Automotive. An acquiring company may be able to win approval to replace outdated factories to create jobs. “More likely they will continue to come in and build new capacity and much of the old will be shuttered if consolidation takes place,” he said in an e-mail. The GM-SAIC partnership has acquired money-losing factories in China in the past, including assets related to Daewoo Motor Co. after GM bought a controlling stake in the bankrupt South Korean automaker. GM and SAIC are partnered on Wuling and its Baojun car brand as part of a strategy to sell vehicles to an emerging working class outside of the major cities, such as Shanghai. Last year, GM added 700 new stores in China and expects to open another 400 this year to have a total of 4,200 locations, Socia, the division president, said. GM’s five-year China plan announced in April 2011 called on doubling its sales to about 5 million in the country from 2.35 million in 2010 and introducing 60 new or refreshed vehicles in there within the same time period. The announcement followed years in which GM’s China sales increased 68 percent in 2009 and 29 percent in 2010, before the country’s rapid economic growth slowed. With its Chinese partners, GM has eight production centers in China with the capacity of building 3.35 million vehicles this year, according to researcher IHS Automotive. GM, which strives to build vehicles where they’re sold, will have straight-time capacity to build as many 4 million units in 2015 in China, according to IHS estimates. That includes the two new factories in Wuhan and Chongqing coming online in 2014, said the Northville, Michigan-based research firm. The automaker aims to outpace the market again in 2013, Socia told reporters in Detroit. 2013 China Automotive Perspective: "Time for a Model Change"
As the Danish physicist Niels Bohr famously pointed out, it is exceedingly difficult to make predictions, especially about the future. For the Chinese automotive industry, this has never been more true than today, with next year’s expert forecasts ranging from a respectable 6% growth rate to as high as 15% - an astonishing 150% spread. This unusually high level of uncertainty reflects the fact that the industry has arrived at a crucial inflection point in its lifecycle. Several factors suggest that a structural shift is indeed underway. Industry growth has, in fact, already slowed to a mere 4.3% in 2012, primarily due to the elimination of Beijing’s aggressive purchase incentives that were put in place after the recent global financial crisis. In addition, new vehicle ownership restrictions in China’s largest cities and rapidly increasing fuel prices will further restrict sales in the coming years, especially for entry-level models. As a result, industry growth rates will likely downshift permanently from the double-digit levels of the past to a slower and more sustainable pattern in line with expected GDP growth of around 8%. At the same time, many consumers in China’s vast interior provinces will soon cross the so-called mobility threshold and start purchasing entry-level cars instead of scooters and motorcycles. These first-time buyers will be very different from their richer cousins in megacities, such as Beijing and Shanghai, so that demand will likely become much more binary, with increasingly up-scale replacement demand from high income consumers in the East versus decidedly more down-market first-time demand from lower income customers in the West. As industry growth slows, manufacturing overcapacity will begin to reach critical levels, especially for many domestic brands who invested heavily in new plants during the last few years in anticipation of continued strong customer demand. Many will have to raise incentives to sell down excess inventories, inadvertently force their competitors to do the same, and triggering the opportunistic, deal-based, sales process that is so characteristic of the industry elsewhere. In fact, it is not unlikely that the competitive dynamics in China will increasingly start to resemble those in the mature markets, where firms experience large annual profit swings, strong price-based competition, and unrelenting pressure on improving operational efficiency to contain costs. Developing business plans under conditions of high uncertainty is, of course, notoriously difficult, as the traditional linear, “as-is/to-be”, strategy formulation process tends to break down and produce counterproductive results. The key is to adopt a more flexible, scenario-based, approach, while simultaneously investing in no-regret initiatives that will be valuable under any potential outcome. Automakers will have to develop very different strategies for the higher tier markets in the East and the lower tier markets in the West. In the East, they’ll need to focus on developing premium brand strategies and facilities, adopting conquest strategies to attract competitive-make drivers, introducing loyalty initiatives to retain existing buyers, and upgrading their talent bench and other organizational capabilities. In the West, they’ll need to develop value brand strategies and facilities, focus on new customer acquisition strategies, expand their dealer networks, and introduce basic human resource management and other capabilities. Automakers and especially dealers must significantly strengthen their customer management capabilities, both to identify and acquire uncommitted customers from competitive brands as well as to protect their own customer base from the poaching attempts of others. They must transition from a business model that is primarily focused on new car sales towards one that generates profits and customer loyalty throughout the entire ownership cycle of a vehicle, including maintenance and light repair, insurance, after-warranty service contracts, and active used vehicle management. Now that communications technology and especially bandwidth have finally reached acceptable levels, it is time for automakers to dust off their grand digitization strategies of a decade ago. Telematics, in particular, could greatly improve the relevance of automakers’ relationship marketing efforts through direct wireless contact with the vehicle itself. To do so, automakers must greatly improve their ability to integrate their off- and online marketing efforts across devices ranging from the traditional pc to the by now ubiquitous smartphones. Leveraging social media to support, for example, new product launches, will become increasingly important, especially when corporate and dealer marketing efforts can be seamlessly integrated. Rethinking the traditional 4S format and upgrading individual dealer capabilities will be crucial as automakers expand their retail networks into the emerging markets in the West while competing for market share in the higher tier markets elsewhere. For example, they’ll have to experiment with less capital intense, unbundled, dealer formats that are more appropriate for China’s sparsely populated rural markets. In addition, they must invest heavily in training and development to prepare all dealers for what promises to be a far competitive environment in the future. Such training should, at a minimum, include lead management, service retention, complaint handling, and e-Enablement in general. In conclusion, while it is indeed impossible to predict the future precisely, it is quite clear that Chinese automotive industry has entered the early stages of a major transition phase. Automakers would do well to explore each potential future scenario while, at the same time, investing in no-regret moves, such as the ones suggested above, as the industry’s competitive landscape will likely look quite different at the other end of what promises to be a wild ride over the next few years. This is the third installment in a series on the China Commercial Vehicles market. Click here to read the first installment. Click here to read the second installment. Government policy plays leading role in driving the development and eventual consolidation of China’s auto industry. According to the Plan on Adjusting and Revitalizing the Auto Industry promulgated in the early of 2009, “capable Chinese players are encouraged to grow stronger by M&A and restructure”. The plan outlines an intention to consolidate the industry into 2 distinct “tiers”: the Tier 1 group consisting of companies with an annual capacity of 2 million units that are encouraged to acquire smaller automotive companies throughout China, whereas Tier 2 consists of companies with an annual capacity of 1 million units are encouraged to drive regional consolidation. The top 3 HDT manufacturers including FAW, DFM and CNHTC are among the Tier 1 and 2 OEM groups named within this consolidation plan, and are therefore likely to receive extra funding and policy support from the central government when acquiring smaller companies. Responding to the government policy indication, leading auto groups are actively establishing their growth strategies and seeking to build scale advantage. Among them FAW, DFM, BAIC, SAIC, and CNHTC are more likely to be acquirers in industry consolidation among the HDT/MDT players. The early stages of industry consolidation have already begun. Starting from its acquisition of Nanjing Auto Group in 2007, SAIC has expanded their production bases from Shanghai to Yizheng and Nanjing in Jiangsu province. FAW is negotiating with Brilliance on business restructuring and acquisition. If the deal is done, FAW will grow larger than SAIC in terms of scale. After acquiring Changhe and Hafei, the Chang’An Automotive group possesses nine manufacturing bases across the country. The company also stated their plans to merge two to three domestic vehicle companies and one parts company within their next 5-year plan. To defend themselves and avoid being acquired, smaller commercial vehicle companies like JAC, Beiben and others are actively expanding their business coverage, developing special sectors, and establishing product technology cooperation. For global truck manufacturers, the consolidation of the China auto industry implies that a more structured and disciplined market will eventually emerge which will increase the efficiency, scale and R&D capabilities of the remaining competitors. Leading Chinese OEMs will seek to expand their ownership of assets and capabilities needed to compete in an increasingly global business. Chinese OEMs must therefore move up the value chain to deliver products with competitive technology to address a growing demand generated for world-class quality trucks. To achieve this, they will undoubtedly allocate larger investments into product development, enabling better responsiveness to the market. Further, the industry will require better IP protection and enforcement to facilitate technology sharing with international players. Though industry consolidation will likely be a central theme in the next decade, there are several other policy and regulatory trends that pose challenges to the global truck manufacturers in China. First, the China government is closing the gate for international newcomers by raising the entry barrier for new project approval. Automotive industry policy makers have strong concerns with overcapacity risks in the China auto industry. These concerns are having an impact on their willingness to consider new vehicle manufacturing projects including HDT. Therefore, Ministry of Industry and Information Technology (MIIT) released the Admission Management Rule for Commercial Vehicle Enterprises and Products, which took effect from January 1st, 2011, requiring all truck manufacturers to strictly follow current investment and capacity utilization requirements. Despite this, other very challenging policy objectives must also be met, including the upgrading of the technology used in the local brands, new energy vehicle development and export promotion. Global manufacturers who are willing to share critical technology and capabilities with their Chinese partner may be able to successfully receive approval for their new manufacturing project in China. Second, although Chinese policy makers stress their serious attention to the subject, Intellectual Property (IP) protection is an area of great uncertainty for global manufacturers. Global vehicle manufacturers are pushed to transfer their leading technologies in a market where the legislation and law enforcement for IP rights violations is far from sufficient. Many IP related lawsuits claimed by international manufacturers in China have not been met with satisfactory results, such as BMW’s compliant for Hubei Shuanghuan’s styling imitation of X5, Fiat’s claim for Great Wall’s copy of Panda, as well as GM’s claim for Chery’s copy of the Chevrolet Spark. Such issues also extend into areas of technology and other transfer of capabilities. Learning from past experiences, many international manufacturers have taken both technical and commercial measures to protect their IP when cooperating with Chinese partners. For instance, a modular sourcing strategy from Tier 1 suppliers can be employed (instead of sourcing individual component through the Joint Venture) has become a common practice to protect IPR of the multinational partner. Third, global truck manufacturers will increasingly face China unique standards, which are influenced by the local players. Global truck manufacturers who have made significant commitments to the market often feel like a “guest in their own house” when doing business in China. For instance, the delay of Euro 4 gives local MDT/HDT manufacturers more time to develop their technology, as they retain their enormous cost-advantage compared to foreign high-end OEMs. Similar advantage for Local MDT/HDT manufacturers is the current end-of-life regulation, which requires scrapping after 600,000 km. Such developments might be influenced by politics. To mitigate risk of such unfavorable standard, global truck manufacturers have to make proactive efforts in involving and lobbying the organizations that develop regulations. The resources and experience of the Chinese partner in dealing with the policy-makers are also essential to be leveraged to address this challenge. Finally, global truck manufacturers will be exposed to legal compliance risks when working with their Chinese joint venture or affiliated company. In spite of measures taken to address the problem, bribery and other corrupt business practices are common in China. Several years ago, individuals within the Daimler Truck division were implicated in an anti-bribery case in China. Daimler was required to pay as much as USD $185Mn for reconciliation, and the company has been compelled to reinforce corporate compliance in every process of the business operation. Corrective actions such as establishment of a regional compliance office, compliance-related business processes, mandatory compliance training, and a hotline to report violations of compliance behavior have turned out to be highly effective in mitigating the compliance risk for Daimler in China.